After a deep state of slumber, Microsoft is back in the news. This time it is not a smartphone, it is a very useful app that goes by the name SMSOrganizer. 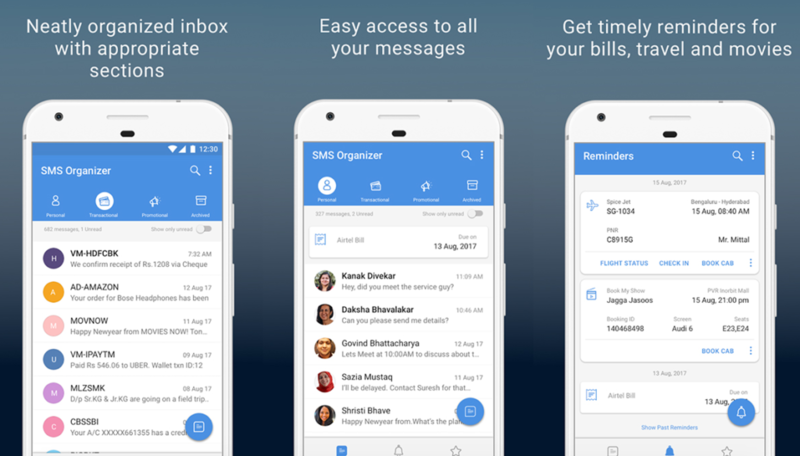 As you must have guessed by the name, yes it is SMS organising app which comes loaded with many useful features to boast off. Let us take a look at those features one by one. The irony here is, the SMSOrganizer app from Microsoft is the best SMS organising application available on the Android platform today. First of all the app is totally free and comes with a very clean and easy to use user interface. There are no ads in the app, and you don’t need to pay a dime to use any of its features. The best thing about this app is the declutters the inbox. the SMSes are organised into Personal, Transactional and Promotional categories based on the sender of the SMS. If you are using this app, you don’t have to worry about missing an important SMS just because your inbox is bombarded with all those useless promotional messages. So, just install this app, and you won’t miss an important SMS again. So, you received an SMS while on the run, and now you are looking for it. Guess what; you don’t have to manually scroll all the way up and down to look for that unread SMS. In this app from Microsoft, you can get all your unread SMS with the tap of a switch given in top right corner of the app. This app aims at giving us a little bit of break from remembering all the dates on which bills are due, or you have an appointment. If you are using this app, you won’t miss a single important event be it an appointment or bill payments date, upcoming movies, flights, trains, buses or just about anything. You can set custom reminders as well. This app comes loaded with man features, and smart assist is one of them. Putting it simply, you don’t have to install multiple apps to track the status of your flights or to get your PNR status. it will take care of everything from inside the app by taking you to the right web page via the reminder cards which is a boon for not so tech-savvy people. Once in a while, we have to switch to a new phone or format our phone due to some issues. Then comes the daunting task of backing up our important SMSes which we don’t want to lose at any cost. There are many third-party apps which charge huge amount of money for backing up and restoring your SMSes. Well, forget all that and just simply back up your messages and restore them on any device at your convenience without paying a dime. This app comes with tons of customisation options. You can set an SMS conversation as your favourite or block a spam sender. Further, you can customise how you receive notifications including tones and fonts. You can also reply from the notification to should you chose to do it. SMSOrganizer does need internet connectivity all the time. All your messages and reminders will work smoothly even if you are on very limited data connectivity or bad network coverage. So, just install this app and let go of all your worries. SMSOrganizer is here to take care of your worries. You can download the SMSOrganizer from here.